New to the Merrimack River Flies lineup of flies for 2011. 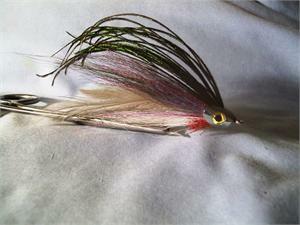 Our best-selling Herring Deceiver fly combined with a fish-skull weighted head! The Fish-Skull streamer weight is an innovative and non-toxic way to add weight and appeal to your streamer flies. Tied with quality Mustad hooks and synthetic material, this fly will stand up to the abuse of bluefish and northern pike. Look for more great fish-skull flies on our pages in the near future. Fly length is between 4 & 5" long. Hooks sizes #2 - 4/0.